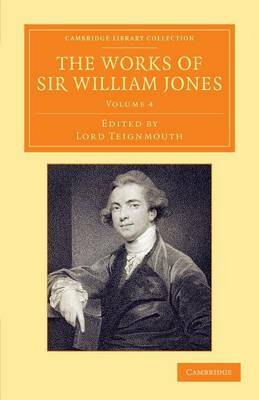 A renowned Enlightenment polymath, Sir William Jones (1746-94) was a lawyer, translator and poet who wrote authoritatively on politics, comparative linguistics and oriental literature. Known initially for his Persian translations and political radicalism, Jones became further celebrated for his study and translation of ancient Sanskrit texts following his appointment to the supreme court in Calcutta in 1783. He spent the next eleven years introducing Europe to the mysticism and rationality of Hinduism through works such as his nine 'Hymns' to Hindu deities and his translation of the Sanskrit classic Sacontalá, influencing Romantic writers from William Blake to August Wilhelm Schlegel. Volume 4 of his thirteen-volume works, published in 1807, contains Jones' extensive Indic scholarship and translations published in British periodicals such as Asiatick Researches and The Asiatick Miscellany, and includes the unprecedented 'On the Musical Modes of the Hindus' (1792) and 'On the Mystical Poetry of the Persians and Hindus' (1791).